Many brands make reeditions of their models which made them known. On Vintage Corner, we prefer selecting for you the most beautiful "original" Vintage items on the market. Luggage: Hermes, Vuitton, Goyard, design furnitures, cameras, old motorbikes, oldtimers, unusual items, gas pumps of the 50's, and many rarities. We wish you a pleasant journey through our site and do not hesitate to make a stop to our email address or via our phone, we will be at your disposal for furtherinformation. 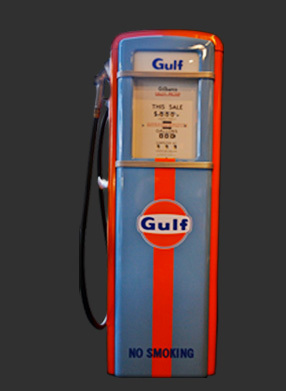 Petrol pump "GULF 60's "
If you have any vintage item for sale send us a complete detail of the piece and we get back to you with an offer within 48 hours.